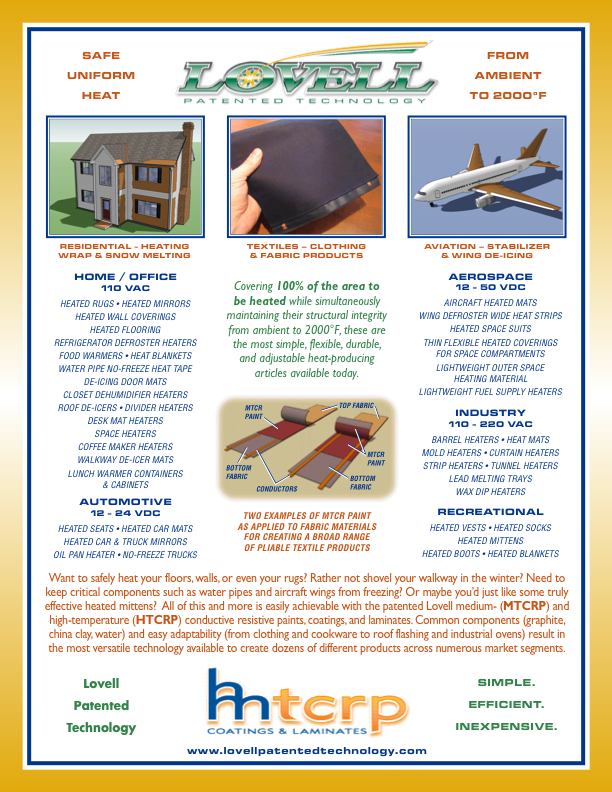 Below is the current marketing and informational brochure for the HTCRP and MTCRP heating laminates, available for viewing or download. 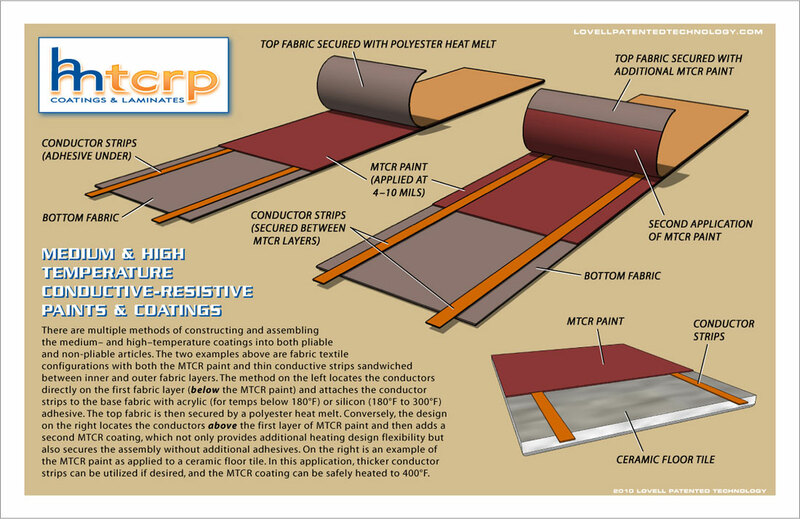 WHAT ARE THE MTCR AND HTCR PAINTS AND COATINGS? They are electrically-resistant, temperature-adjustable paints and coatings that can be applied to a variety of materials in order to provide heat-producing properties. These materials can then be formed into various shapes while simultaneously maintaining both their structural integrity and inherent flexibility. The coatings provide incredibly uniform heat while maintaining their integrity across a broad operating temperature range, from ambient all the way up to 2000°F. These coatings are the most versatile, durable, and adjustable heat-producing articles available today. Click on the images below for more details. WHAT CAN THE MTCR AND HTCR PAINTS & COATINGS DO? 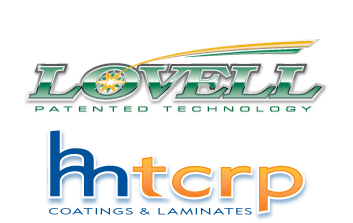 The Lovell MTCR and HTCR paints and coatings solve all of the problems noted below. "Low resistivity paints have traditionally been used to provide coatings having high conductivity for connecting conductors that require a superior electrical bond with a minimum resistance. 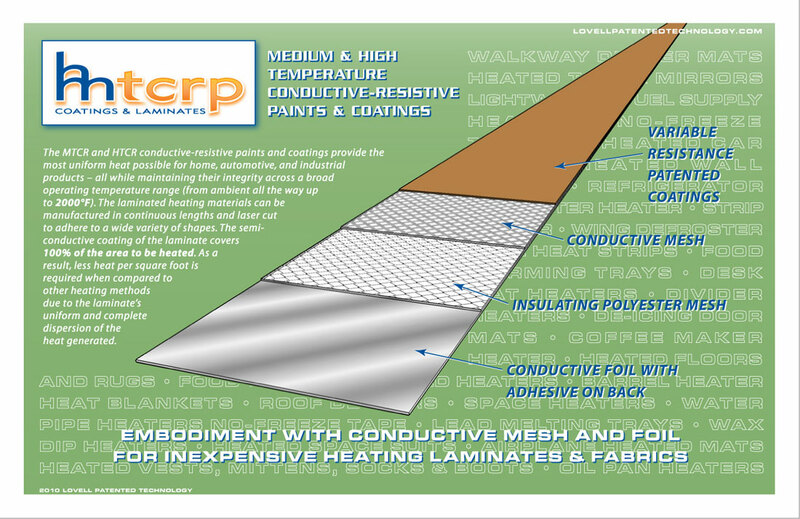 Generally, low resistivity paints cannot be applied to materials in order to produce temperature adjustable heating elements because the low resistivity paint requires a high volume of current to generate a reasonable output of heat. In contrast, the resistivity of traditional highly resistive paints is often so high that a relativity high voltage drop is required in order to generate sufficient heat. Also, the use of traditional high resistivity paints within highly elevated temperatures causes them to oxidize and lose electrical conductivity permanently. Furthermore, when either of the above-identified traditional conductive paints are applied to various substrates, cracks and flaking of the paint often develop over a period of time. Cracks and flaking of the paint coating may cause arcing and unequal power distribution, thereby sacrificing safety. Concomitantly, a breakdown in the temperature adjustable property of the coating may occur, thereby causing an unequal heat distribution upon the surface of the article."